Built with a durable steel and chain design and backed by a three-year unlimited cycle warranty, the WCA-SMART stretch wrapper is made for industrial-grade performance. The customizable automatic turntable can handle up to 70 loads per hour, reaching weights of up to 4,000 pounds. Premium performance features include a 25-inch ring gear with pinion gear drive, carriage gate equipped with spring loaded rollers and AC variable frequency drives for better reliability. With an automatic design that takes care of virtually everything, all you have to do is change the film. 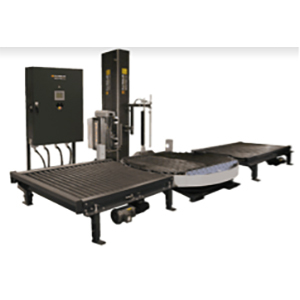 To learn more about the Wulftec WCA-SMART Automatic Conveyorized Turntable Stretch Wrapper, give us a call at (609) 337-3641 or request a quote online. Hughes Enterprises is an essential part of your operations team. Don’t wonder who to call when downtime strikes. Reach out to our factory certified support technicians 24/7 for equipment installation, maintenance or emergency service requests. Why Should You Stretch Wrap?